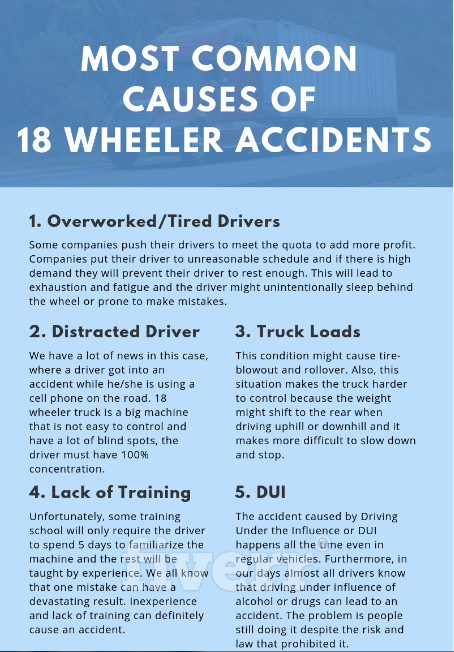 This infographic relates to common causes of 18-wheeler truck accidents. In the last reported year, there were almost 100,000 accidents involving big trucks. As you may suspect, when a large truck that can weigh up to 80,000 pounds hits another vehicle the damage can be exceptional. Some of the most common causes of 18-wheeler accidents are driver fatigue, distracted driving, violations of the safety regulations and lack of proper safety training. Each one of these factors individually or with others can contribute to accidents which should not have occurred. Also, less frequently, drugs and alcohol can play a role in a smaller percentage of accidents involving tractor-trailers or big rigs. With the legalization of marijuana in many states the substance has become more prevalent recently and many vehicle accidents. Victims of an accident with an 18-wheeler should be aware of all the potential causes of which this illustration is a start. It is highly recommended that anyone affected by a large truck crash contact Texas Truck Accident Lawyer counsel experienced in these types of cases.